We take great pride in providing our guests with a memorable experience. Walk through our doors and immediately you will appreciate our attention to detail. Our B&Bs offer all the comforts of home and much more. Let us personalize your visit with additional arrangements planned for your arrival and throughout your stay with us. Without a doubt our guests compliment us with wonderful reviews. And then there is the food factor, well, let us say breakfast will be a highlight of your stay - after all, breakfast is half of what we do. We are pleased to arrange your arrival snack or meal, day adventures, events, theatre tickets, bike rentals and car rentals for your stay - let us know your interests and needs and we will ensure everything is taken care of for your worry-free, relaxing stay with us! Windswept cottages offer the perfect location for a family getaway and much like our B&Bs, we also offer meals, treats and adventures in addition to all the comforts of home. There is plenty of outdoor green-space, decks and docks for chilling by the waterfront. Plan as much or as little as you want, be sure to include a little time to simply relax, enjoy paddling, fishing or swimming. We are pleased to arrange your arrival snack or meal, and get groceries for your entire stay. Just download our Grocery List), fill in and email back to us. We'd love to book your day adventures, events, theatre tickets, bike rentals and car rentals for your stay - let us know your interests and needs and we will ensure everything is taken care of for your worry-free, relaxing stay with us! Windswept on the Trent is a prestigious, four-season, waterfront property featuring all the spoils of the good life. 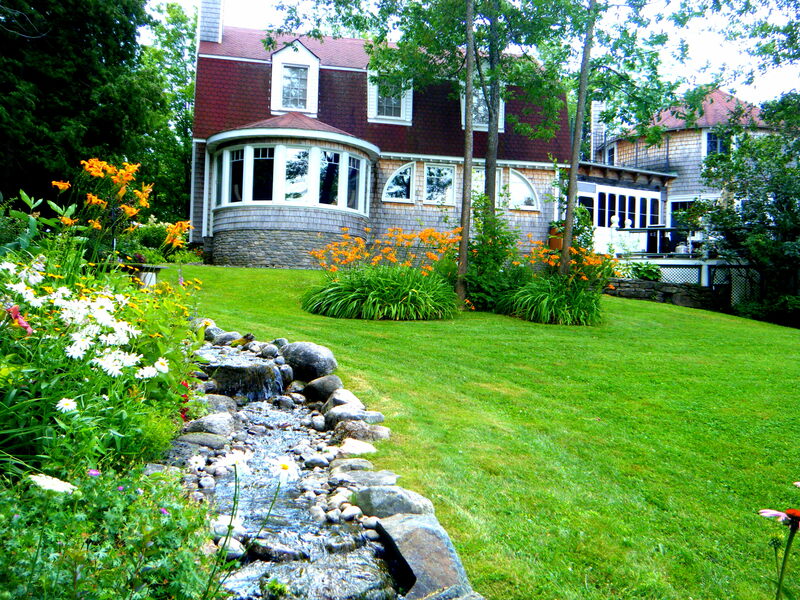 This exceptional property is located just north of Campbellford, Ontario, Canada on the Trent River. It boasts solitude, discretion and privacy, yet offers high speed WiFi to keep you connected, if you wish. Windswept on the Trent is the perfect location for a Retreat, Small Boutique Wedding, Business Meeting, Team Building or Workshop event for up to 40 people. This picture perfect hideaway features a state of the art meeting facility, wired or wireless high speed internet, LCD projector, video conferencing, catering services and all the tools required for a successful event. The property features two suites, each with a super cozy living room, microwave and small fridge. One suite accommodates up to six people, the other makes comfort for up to four. Windswept on the Trent is designed for relaxation, from its’ well-appointed suites to its’ wrap-around deck, dock and screened-in bunkie. The property offers stunning sunsets, amazing stargazing opportunity and relaxing vistas for reading or contemplating life. For those who prefer a little more adventure we invite you to grab a paddle and canoe for an excursion around our island. Let the breezes at Windswept sweep you away! We are happy to book day trips, events and rentals for you - as well as greet you with a hassle-free meal, beverage or treat upon your arrival - see extras when booking your stay with us. We want you to enjoy every second with us from the moment you arrive.... just arrive, relax, we got this!! The perfect location for your small wedding party, family retreat, hiking/cycling getaway and the business traveler This exquisite, four season property is within walking distance of local cuisine, gift shops, boat docking, tourist information, the Trans-Canada Trail, the Trent River Cycling Route, the Ranney Gorge Suspension Bridge and is close to Ferris Provincial Park. All five of our themed rooms, including the Honeymoon suite have ensuite baths, luxurious duvets, cozy bathrobes, and heated towel bars. Each room is designed for your ultimate comfort, with individual controls for air conditioning or heat, and satellite radio and free WiFi. An outdoor hot tub on the second floor balcony will help you unwind from your long day. Emilyville also has one wheelchair accessible room and a steam shower. We serve a delectable full breakfast each morning especially for you, please let us know about any dietary concerns or allergies. We are also please to serve any other needs you may have during your stay, let us know how we can make your visit perfect. We invite you to relax in our large living room with oversize couches and cable tv or watch a DVD. Enjoy a scrumptious breakfast served in the dining room or sunroom and simply watch the world go by. We are proud to say, our breakfasts each morning feature the bounty of our farmers within Northumberland County. If you have any dietary concerns or allergies, please let us know in advance, our guests are our number one priority. Each room in the Hastings House is themed in its decoration and features an ensuite bath, stereo music and free WiFi. You may choose from a King or Queen beds, and for your lounging pleasure, fabulous cozy bathrobes! We are committed to excellence and strive to exceed our guest’s expectations. *King bed can convert to two twin beds. We can also add a cot to accommodate three people. Our 3 bedroom cottage overlooking the picturesque Crowe River. The master bedroom features an ensuite bath, the second bedroom has a double bed and the smaller bedroom features bunk beds. This cottage is great for a family getaway, for you alone or a couple or for friends it sleeps a maximum of 6 people, has a big kitchen & family room overlooking the Crowe River. In summer walk on the rocks or swim. Allan Mills is a short drive from the Crowe Bridge and Healey Falls. Great for fishing, kayaking or just a relaxing stay at the cottage. Enjoy a relaxing week at our Seymour Point Cottage on Lake Seymour just outside of Campbellford near Healey Falls. It is the ideal location for friends, family, a week away, fishing and fun. The cottage offers a canoe, outdoor fire pit, BBQ, deck, large kitchen with pots and pans and a dining area. There are three bedrooms, one with a queen bed and walkout to the deck for your morning coffee with a view, The second bedroom offers a double bed and the third, two twin beds - lots of space for up to 6 people. This well-equipped vacation cottage also offers internet and satellite TV for your enjoyment. You will want to visit Healey Falls Lock while staying at Seymour Point Cottage, well known as the largest vertical drop in elevation on the Trent Severn Waterway system! This four bedroom home with a large living and dining area and a gourmet kitchen was originally constructed for William Ashton, Master Mechanic at the Trent Valley Woolen Mills, this home is a two-story cruciform structure of brick veneer, with sill and above-grade foundation walls of cut limestone. The façade has a projecting bay flanked by wooden verandas decorated with fretwork. The bay has a ground floor two light window, one pane being stained glass. Above the main window is a single-mullion double-hung sash window. Remaining windows are all double-hung single-light sash. Most of the original shutters are still in place. The attic is lit by four half-round windows set in the north Dormer and the south, east and west gables. Details on the gable ends include a king post, a finial and a decorative truss. The main entrance door has a stained glass transom. Fly in by float plane to your own Private Island or boat over and stay in our unique eco-friendly cabin full of charm with a screened in porch, outdoor kitchen, compost-able toilet, outdoor shower and a wood fired hot tub. Sleeps up to 4.